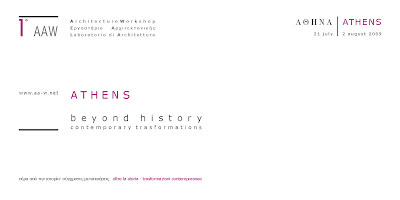 The Sandman Chronicles: The First Athens Architecture Workshop starts today! 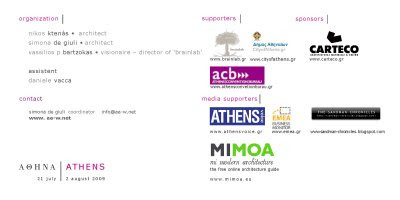 The First Athens Architecture Workshop starts today! The city of Athens rises to the north of the Acropolis in a vast plain of the Attican peninsula, dotted with low hills and circumscribed by mountains and unfolding to the south towards the sea. To the west of the city stands Mount Egaleo, to the North-West Mount Parnitha, to the North-East Mount Pentelikon and south-east the linear formation of Mount Ymittos. 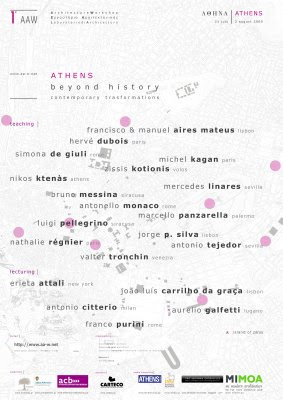 The ancient urban unity of Athens reached its highest level of completeness, Between the 5th and 4th centuries B.C. In this era the polis expanded across the plain from the “sacred rock” of the Acropolis to the sea with the “Great walls” to Piraeus, the port on the Saronic Gulf (Saronikos Kolpos). IV century BC - After the Ottoman occupation the city grows beyond its ancient boundaries. Great roads unify the ancient to the new radially towards the North. Actually, the city occupies a vast area, which extends from the aforementioned circumscribing mountains to the sea on the South and from Marathon to Eleusis, east and west respectively. In its contemporary urban form, two images of the city coexist, that of the ancient city integrated with that of the neoclassical period, on one hand and that of the diffused city as a result of the spontaneous growth of the modern metropolis, on the other. Nevertheless, the signs of the ancient city have remained as “indelible” components in the memory of contemporary Athens, which through the years has “rewritten” its history on the ancient traces. Seven sites have been chosen for the purposes of this workshop, located between the ancient and the 19th century areas of the city centre. 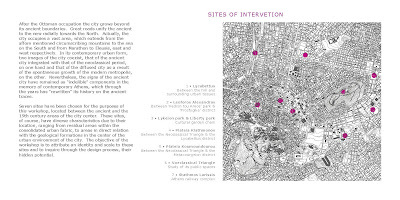 These sites, of course, have diverse characteristics due to their location, ranging from residual areas within the consolidated urban fabric, to areas in direct relation with the geological formations in the centre of the urban environment of the city. The objective of the workshop is to attribute an identity and scale to these sites and to inquire through the design process, their hidden potential.